Fresh dough, mozzarella and other locally-sourced ingredients can be found at these fantastic Maryland pizza joints. The state is filled with an abundance of authentic, family-run businesses serving up unique pies you won’t find anywhere else! Head to any of these hungry, and you are sure to leave happy. These pizza restaurants are the 10 best in Maryland! This is authentic Italian home-cooking at its best. Local and delicious. They use the freshest ingredients just like you would expect to find in your Italian grandma’s kitchen. The pizzas are simple and classic which is part of what makes it taste so authentic. Try the Parma with prosciutto, arugula, parmigiana and mozzarella and you will taste how fresh the cheese is. You’ll be giving up on the pizza chains long before you leave. Featured on “Diner’s, Drive-Ins & Dives,” Johnny Rad’s is serving up homemade pies with bold flavors. On the show, they featured the Trainwreck, a pizza with mushrooms, spinach, black olives, olive oil, mozzarella and sea salt. The cheese will melt in your mouth and you can even pick up your favorite pie, beer and wine to go, for a movie night at home. Since 1962, Ponzetti’s has been a favorite for ocean-going vacationers in Maryland and all throughout the Mid-Atlantic. You come here for classic pies that hit the spot, friendly service, and a family atmosphere that makes you want to stay awhile. They have branched out into unique specialty pizzas as well but the classics are still the best. For something totally unique, try their mac and cheese pizza or their Greek pizza. The flavors are killer and you would never expect to find them on a brick oven pizza but it totally works. You’ll just want to keep coming back. Everything is made fresh, and if you are local they deliver. That’s a total score when you don’t want pizza from a national chain. 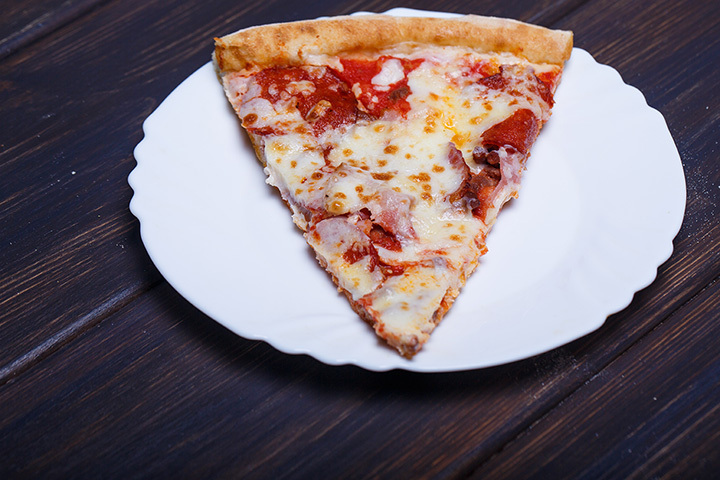 Deep dish pizza with your choice of fresh toppings means that everyone in the family or at the party will find something to love when ordering from this 20-year-old family pizzeria. For 15 years, they have been serving pizza in Frederick where you can even get servings as small as a bagel. This is perfect for families that have little ones because you can get a large specialty pizza for the grownups and small bagel-sized pizza for the toddler. This is an artisan shop that uses thin crust dough and fresh ingredients. Try a pizza with their chopped tomato-sweet red onion sauce. Plus, there are unique cheeses you can try such as Manchengo and Grana Padano. For vegetables, they offer unique options like eggplant and butternut squash, that you may never find anywhere else, on a pizza. You can customize a truly unique pizza at Bagby’s. Wood-fired pizza in a cool atmosphere where you can sit on the patio and soak up the Maryland sun makes for a perfect afternoon at Ava’s. Their dough and mozzarella is handmade for that truly authentic taste. Try the staple, their Boardwalk Pizza made with mozzarella and provolone. You might actually want to get fat when eating at Fat Daddy’s. Yummy goodness is sure to make you overeat and want to come back for more the next day. Pair your homemade pie with something tasty like calamari, then finish it the deliciousness with one of their local beers on tap. It’s the perfect spot after a day at the beach. When in SoMo head to Nicoletti’s. They opened as a family-run restaurant in 1981 and have been serving classic recipes ever since. Being that the family is Italian, people come here for the authentic pies and mouthwatering desert. Their gelato is fabulous and with 16 flavors to choose from, you will want to head here instead of an ice cream chain. Just be warned that your kids will want to keep coming back!